Canada isn't the first place most people think of when they imagine a sunny vineyard, bursting with ripe grapes, ready to be made into delicious wine. However, this often cold, Northern country has a robust stable of wine regions just waiting to be discovered. If you are aware of Canada's reputation for a high-quality dessert wine style known as 'Ice Wine', you will be excited to know that this country is also capable of producing plenty more fantastic wine styles. Canada's wine regions mostly occur in it's Southern regions, and we will break them up by Province. Niagara-on-the-Lake is known as the birthplace of the modern Ontario wine industry, it is also known as "the prettiest town in Canada". This region is a sub-appellation of the greater Niagara Peninsula and lies directly across Lake Ontario from the city of Toronto. This large body of water helps moderate the colder temperatures that can be common here and the constant temperature at night in Autumn creates some of the most stable conditions in the world for producing the 'Ice Wine' style, for which Niagara-on-the-Lake has become famous. The 26 currently operating vineyards of Niagara-on-the-Lake have been champions of sustainable winemaking since the first plantings here and this approach has lead to the consistent production of high quality wines. Konzelmann Estate Winery vineyard with a view of Lake Ontario and Toronto in the background. The Niagara Escarpment is a large ridge carved by ancient glaciers that is responsible for the world-famous Niagara Falls. The Escarpment is a 335 m (575 ft) high ridge that winds for 725 km (550 mi) from New York State through the Niagara Penninsula and into southern Ontario. The Escarpment allows vineyards to benefit from Lake Ontario's off-shore breezes by reflecting them back to the lake, maintaining a constant and active airflow. This air circulation discourages cold air from settling in low lying areas and maximizes the moderating effect of the warm waters of the lake in the winter. The Twenty Mile Bench is a high-quality segment within the Niagara Escarpment itself. In places the land rises gently in large terraces, or benches, but there is a varied and complex topography, with many changing slopes. Glacial activity has provided deep clay with a high proportion of limestone and shale. Both of these areas hide many boutique wineries that are known for their laid-back, relaxed attitudes and are very proud to produce 100% Ontario wines with no imported must. Vineyard with the Niagara Escarpment in the background. Heading East along the Northern shore of Lake Ontario will lead you right to Canada's fastest growing wine region: Prince Edward County. With over nearly 40 wineries already established and more being founded every year, this area of rich agricultural history is becoming a force to be reckoned with. Prince Edward County has an unusual position, being so close to the Northern lake shore, as while the lake's moderating effect keeps the temperature nominal and shields the fruit from early Autumn frosts, it can do little to protect these vines against the harsh Canadian Winter where temperatures can dip below -24 degrees Celsius. To defend against such a fierce cold (which can actually kill the buds within their protective winter scaling), the vintners of this wine region perform a process that is known as "hilling up". To "hill up" the vines, is to bury the vines beneath mounds of earth in order to insulate them enough to survive the tough Winter. In Spring these vines must then be removed delicately from the soil by hand as to avoid any damage. This wine region is experimenting with a combination of hybrids (such as Baco Noir) and classical Vinifera varieties like Merlot and Riesling. 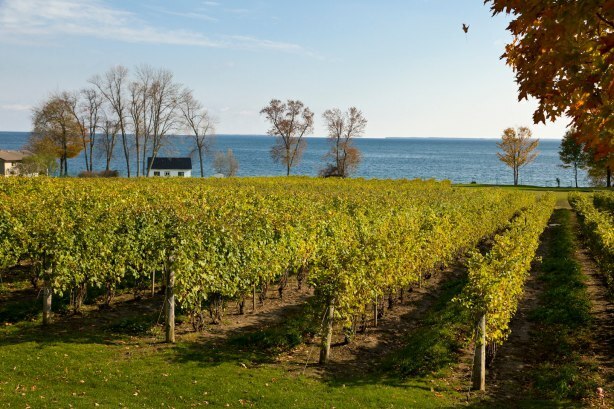 The Lake Erie North Shore & Pelee Island Appellation is Canada's most southerly wine growing region, lying on the same latitude as the winemaking centres of the Mediterranean Coastline in Europe. Situated just 30 minutes to the South-East of Detriot and 4 hours South-West of Toronto, this region is surrounded by water on three sides (Detriot River, Lake St Clair and Lake Erie) which creates a unique maritime climate in a continental region. Lake Erie North Shore & Pelee Island was also the site of many of Canada's early forays into winemaking, with Canada's first commercial winery, Vin Villa Estates, being founded in 1866 on Pelee Island by a trio of gentleman farmers from Kentucky; D.J.Williams, Thomas Williams and Thaddeus Smith. High Summer heat (moderated to a certain degree by cooling lake-side breezes) coupled with Ontario's longest growing season, help this lake-side region produce some of the most full-bodied wines, that Ontario is capable of including, Chardonnay, Merlot and Cabernet Franc. Pelee Island from the air. The Okanagan Valley Wine Region lies roughly 400km East of Vancouver and now contains more than 82% of the vineyards in British Columbia. The valley itself stretches North to South more than 250km, with (160km of this being suitable for grape-growing) affording the region a large array of sub regions and soil types. Okanagan Valley currently has over 8,000 acres of vineyards, with most clinging to the shoreline of the various lakes and rivers that link the valley together, though further vineyard planting are now climbing the hillsides along the valley walls. The wine region was first founded in the 1850's by missionaries, however this attempt at wine production was wiped out by Canadian Prohibition in the early 20th Century. Revived in 1931 by Calona Winery, who kept the industry alive by making fruit wines and wines made from hybrid varieties, the area came into it's own after 1975 when Vitis Vinifera varieties found their way back to the valley. Nowadays, the Okanagan Valley produces almost every style of wine imaginable, from still whites, sparkling wines, and fortified wines, to robust. full bodied reds and of course dessert styles, with the most notable being some of the finest examples of ice wine Canada has to offer. Notable Vitis Vinifera varieties planted include: Merlot, Chardonnay, Pinot Noir, Pinot Gris, Riesling, and Gewürztraminer. More recent plantings have shown an affinity for warm climate wines which include Sangiovese, Syrah, Zinfandel, Tempranillo and Malbec amongst others. This capability to ripen so many different varieties is unrivalled within Canada and causes this region to now be the envy of many wine regions worldwide as well. The stunning Vancouver Island is located just across the Straight of Georgia from Vancouver itself, and between the years of 1983 and 1990 was home to a provincial government-funded grape growing trial - The Duncan Project - which assessed about 100 different varieties and identified Pinot Gris, Auxerrois and Ortega as varieties that would to well in this challenging seaside environment. The first winery, Zannata Winery, opened in 1992, following this initiative, after which a wave of vineyard plantings swiftly followed. Vancouver Island now has an impressive 430 acres planted up and down the Eastern coast of the island, with Pinot Noir and Pinot Gris being the most planted varieties at this time. Located in the Strait of Georgia that separates Vancouver Island for mainland British Columbia, these five islands have grown to be small isolated hubs for vineyards to thrive. Connected by a network of small, locally-operated ferries, the 10 wineries currently operating across these islands are now a part of British Columbia's newest designated viticultural area. These islands mainly focus on Pinot Noir, Pinot Gris and the hybrid varieties, Ortega and Maréchal Foch. The Fraser Valley lies less than 100km east of down town Vancouver, making it a very accessible area for weekend-trippers from the big smoke. This area's first winery opened up in 1991 and since then this agricultural heartland has expanded to 30 vineyards and 15 wineries. So far, this still only amounts to a tiny 63 acres of grapevines planted, but as it's popularity grows, this is sure to increase. As with many wine regions in Canada, Fraser Valley vineyards are still relying heavily on hybrid varietes, with Swiss winemaker, Valentine Blattner's red and white hybrids being the most planted varieties, followed by the much more classical Pinot Noir (which could be a great success as Pinot Noir has done very well in other cool climate wine regions). It's not surprising you haven't heard of the Similkameen Valley before. It's a mere 20-30 minute drive to the West of some of the Okanagan Valley's most loved wineries, and so is often overlooked in favour of the more well-known producers. This wine region clings to the fertile alluvial flats close to the Similkameen River, and is backed by harsh, near desert-like environments along the valley walls. Growing quickly as an agricultural hub, this area already has over 600 acres of vineyards and many fruit orchards, both of which benefit from it's hot, dry climate as well as it's famous winds that whip through the valley keeping out pests and disease. Similkameen vineyards often sold their fruit to Okanagan wineries in the early days and as such their wonderful grapes saw very little of the spotlight, nowadays these vineyards are looking to keep the awards for themselves and are banding together to build wineries of their own. Incredibly complex soils are found in this wine region, ranging from soils deposited by retreating glaciers, flood/melt-waters to wind-blown soils and alluvial fans, all supported by coarse rocky material broken down from the surrounding mountains. This myriad of soil types can support many varieties of grapes and this region is known for it's aromatic whites and complex, full bodied reds. Nova Scotia's grape growing history goes back to the 1600's when the area was one of the first areas to cultivate grapes in North America. To the extreme East of mainland Canada, Nova Scotia's vineyards are moderated by the cold Atlantic Ocean. After 25 years of renewed interest in wine, Nova Scotia now has 550 acres under vine and over 70 growers spread across 7 regions. These regions are Annapolis Valley, Gaspereau Valley, Avon Valley, LaHave River Valley, Bear River and Marble Mountain, Malagash Peninsula and finally Cape Breton. Nova Scotia's growing wine regions has grown to be known for crisp, aromatic white wines with bright acidity, perfect for the seafood the Atlantic Coast produces so well. This was further confirmed by the first appellation for Nova Scotia: "Tidal Bay". The producer list is not set in stone as annual blind tastings keep this appellation only for wines that reflect the style of Nova Scotia. Currently the appellation only has 10 vineyards producing 'Tidal Bay' wine. Growing wine in the cold Eastern province of Quebec does make some sense. This very cold area of Canada is steeped in French influence and culture, so naturally wine and cheese would be required in large amounts in this region. Quebec wineries are mostly located in the St. Lawrence river valley in the South of the province. It is a small wine region however, consisting of only about 30 wineries, many of which are scattered to the East of Montreal in the Eastern Townships, though a handful of vineyards are found as far North as the outskirts of Quebec City. All the varieties grown in Quebec need to be resistant against the harsh cold and need to ripen early as the to avoid the onset of the four months of Winter that will freeze the land deep enough that many European varieties cannot survive. Most commonly grown in Quebec are the hybrid varieties Marechal Foch, Frontenac, Vidal and Seyval Blanc. Now our journey is over! As you have surely now realized, Canada is surprisingly varied when it comes to it's wine regions, and though it is still a young wine producing country, all signs point to a very successful future. Although some wine regions are still relying on inferior quality, cold-resistant hybrid species of grapes, many are now turning to cold climate, hardy Vinifera varieties. Although provincial liquor laws make it difficult to find many of Canada's finest wines outside of the country, hopefully continued support of the local wine industry will lead to a bottle of Canadian wine finding it's way to a store near you soon.